The 848 large single bowl undermount sink is made from a granite composite material that is comprised of 80% Quartz and 20% Acrylic. The 848 is stain and scratch resistant and can resist heat up to 550 degrees. 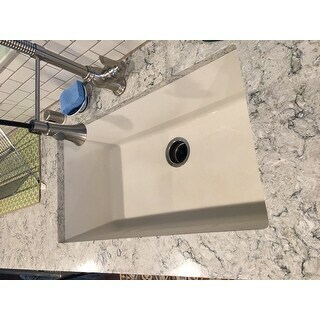 The overall dimensions of the sink are 32 5/8 x 18 3/8" x 9 1/4" and a 33" minimum cabinet size is required. 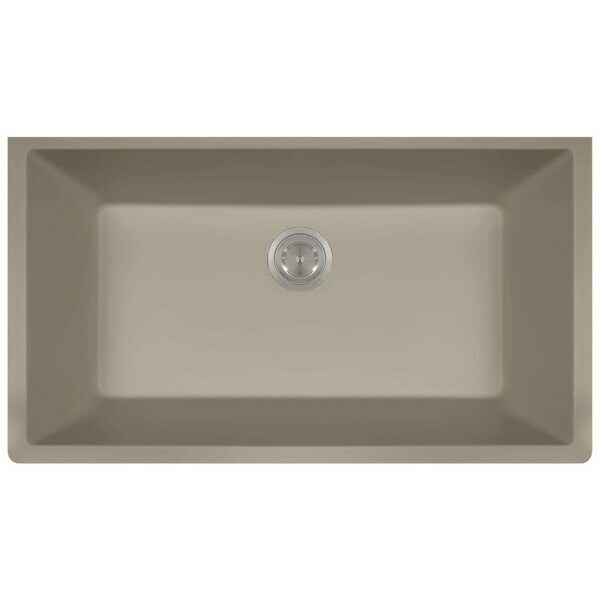 The sink contains a 3 1/2 offset drain and is available in multiple colors. As always, our TruGranite sinks are covered under a limited lifetime warranty for as long as you own the sink. 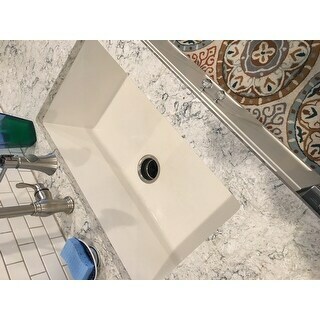 I have been using this sink for a week now and I absolutely love it! I was worried to order sight unseen but don't be. Its quality and so far I couldn't be happier. I am very happy with this sink. The color is true to expectations, the size is generous, making it very easy to use. I am able to easily wash my largest electric griddle with room to spare. I added a garbage disposer, which has an opening a fraction of an inch different from the one that comes with the sink, so I needed to use that sink stopper rather than the color coordinated one that came with the sink. If this is important to you, consider that when purchasing the disposer. I am very satisfied. Love the depth and width. Pitch needs to be more at an angle. So a sprayer facuet is helpful to spray the food to the drain. Metal pans will leave marks but it is a easy clean up, a few wipes with a soft sponge. Live this sink. It's deep, so all dinner dishes are hidden while we eat. Very easy to clean . Feels porous, but nothing stains. This sink is really nice and meets the description well. I love the size! I'm hoping it wears as well as it looks. This sink is awesome. BIG it holds the biggest pots. And the savings was great. Just what we needed to go with the Slate appliances! nice a deep looks great! "We have this beautiful kitchen sink. It is very durable however I am planning to start getting my hair done in it. Will the chemicals used stain the item during the wash/rinse? Please please advise, thanks!" Thank you OS for not answering my question in the 1 hour timeframe posted once submitted, real nice. You could’ve at least given me some sort of guidance of where to go, whom else to contact, but instead nothing..... disappointed to say the least. "Does the sink bottom slant to the drain or is is flat? We have a flat single well sink now an I have to push food toward the disposal drain." It is a flat bottom. "one reviewer said it matched the slate appliances....what color option would that be? I need one!!" Pictured from left to right is slate, black, silver, white, and mocha. You can use the options drop down menu to chose the "slate" color option. "Does this sink come with drain?" Hello Tricia, the sink does not include the basket drain. Thanks for shopping with us. "Hello, I want to order this kitchen sink. The color name does not show up with the picture. How do we know what color to order? Very confusing." Hello jmorley, pictured from left to right is slate, black, silver, white, mocha and silver. Thanks for shopping with us! Simple, modern, cost-efficient, durable material.